As promised, here is the wooden handplane tutorial! For anyone who missed the other post…this is a tutorial on how to build wooden handplanes – I said a Krenov plane, but my method deviates a wee bit from a true Krenov plane. The plane above is what this tutorial will teach you how to make. The first thing I want to say is – I am not an expert at making handplanes! I have made several handplanes, but this is homegrown lutherie, so I’m just a hack. If you want to see perfection in handplane making, check out Konrad Sauer’s blog (or Holtey). However – I have found that most of the tutorials that you can find online don’t really have enough information for the beginner to understand what really makes a handplane good. So I want to make this very detailed, so that anyone can follow it and end up with a really nice (and more importantly, well functioning) handplane. This technique can be used for any wooden handplane really. The one I’m working on is a High Angle Smoother (a smaller one, with 1.5″ iron). 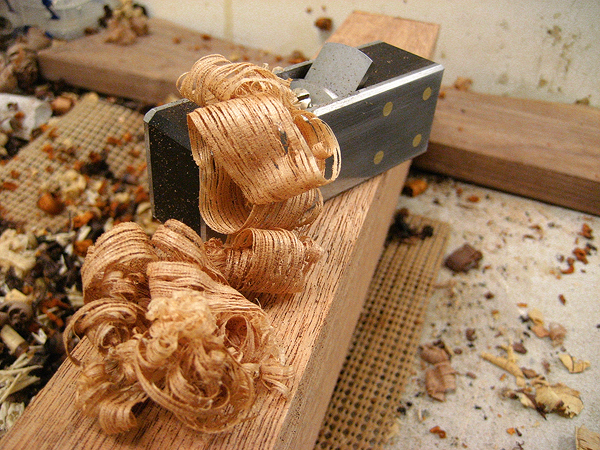 Hopefully by the end of this tutorial anyone who has read it will be able to go forth and make a wooden handplane. This is not the blade for this plane, but this iron is the same width so I’m using it to guide the build. This plane will be made out of this nice big piece of ebony that has been on my workbench for a couple weeks now. The wood itself doesn’t matter so much, but it should not be a softwood (use Cherry, Maple, etc.). Harder woods are better than softer woods. First step is to joint two sides perpendicular to one another. Plane the other four sides. Checking for squareness – the four sides have to be perfectly square, pay careful attention to this. Keeping everything square at this stage makes life a lot easier down the road. Plane the thickness of the board to the same as your iron width (in this case 35 mm). This piece of ebony will actually yield four planes for me (one Krenov smoother and three 22-25 mm Miniature infill planes), so I marked off how this will be cut. For the smoother, I marked out a 55 degree bed angle. Next up was to cut the pieces out on the bandsaw. The skinny piece will make the sides of the Krenov; the fat one is the body. The rest is for small metal planes. Cut out along the lines marked for the bed angle. The other angle roughly matches the bed angle, but 45 degrees or somewhere around there is usually good. After cutting, the bed angle will not be square to the sides. It was hard to capture in a photo but what I am checking for squareness of here is the bed angle against both the left and right sides of the plane. Very carefully (making sure not to remove too much material), the angle is squared up on a belt sander. With the disc sander, I also square up the nose of each of the two body pieces. Check that the nose is square to the sides as well. The reason for this is that the plane bottom will have to be re-flattened from time to time, each time making the plane a little thinner by removing material from the mouth. If you don’t square up the noses on each piece, the mouth of the plane will get a little wider each time the bottom is lapped. For smaller planes etc. this isn’t really important, but the smooth plane requires a tight mouth so it is important here. Also, I took this picture but I made the noses a little more flat than this, maybe 2 mm or so. Double check the blade angle. Sometimes it’s helpful if you happen to have three arms for this, the blade likes to slide if you are using a good heavy one. Especially trying to take a picture at the same time. This blade did come out around 55 degrees though – doesn’t need to be exact, within 1-2 degrees is alright, maybe more depending on your preference. This one was right on the money though pretty well (it actually came out at 55.5 or so). Usually I would rather go with 1-2 degrees off rather than taking off more material, unless it has made the bed angle more than 60 degrees (which I consider a bit too much). Next up, just the faces of the blade bed and the other block are buffed to a high gloss. This plane will not be getting a finish, except maybe a rub with some oil if I’m concerned about cracking over time. The faces are buffed now because they cannot be once the plane is assembled. Next up – the sides. Plane the other side flat so that is is flat on both sides and nice and square. Cut the piece in half to make two sides. Starting to look a bit like a plane now! Another operation that requires three arms (when trying to photograph, anyways). With one side in place and lined up with the rear of the plane as it will be glued, the blade thickness is marked. The thickness of the wedge is added, which is the second line drawn here. In this case, this plane will ultimately be receiving a lever cap rather than a wedge. The cross pin position is traced so that it will be placed at the edge of the lever cap or wedge. This is then drilled to the same size as the pin that will be used. In this case, my pin is 3/16″ brass. The two sides are clamped together while drilling the hole, ensuring that the hole is drill in exactly the same place on both sides. Check everything for squareness one more time. Key areas are the sides, the bed angle of both the blade and the opposite piece (the other angled cut), and the flat noses of each piece. Check the bottom. The only areas that are not critical at this point are the back and front ends, plus the top. The inside of each side is buffed only where it will be visible (since, like with the bed angle, this cannot be accessed to polish/finish once the plane has been glued up). Now the sides are glued on. Two things are important here – 1) try to keep everything lined up flat on the bottom of the plane, and 2) make absolutely sure that your cross pin is lined up square with the bed angle. You can either do this by making a wedge to insert which you’ve squared up in advance, or by sighting down the bed to see how if the pin lines up straight with the mouth (this is the way I do it). Both of these methods require that you glue the cross pin in at the same time as the sides. The cross pin being straight is more critical than the bottom being dead flat at this point. Another thing to note is that I use epoxy rather than wood glue – as a result, I do only one side at a time (since the open time is only 5 minutes). Here it is after both sides have been glued. Use the square to mark lines for cutting the ends off so everything is flush. After it has been cut on the bandsaw, I sand both ends flat and square to the rest of the body. This plane will be getting a lever cap, but I made up a quick wedge just to test this out. I ran the bottom of the plane across the jointer (being careful to only take off a small amount of material) to true up the sole so it is dead flat. This plane will be getting a Hock 1.5″ iron – so these cuts are with a mouth which is a bit too wide (more than 1mm), since this iron is only 3 mm thick (compared with the 4.8 mm hock irons). That’s all for today. Tomorrow I will do some chamfers on the sides etc. and give the plane a bit more shape, then buff it to a high gloss on the buffing wheel. After that it will be time to start thinking about the Lever Cap. The image gallery has been updated again! I’ve also finished another handplane – well, it is not quite there yet, but will be done tomorrow. It does not have an iron yet but I should be receiving it tomorrow. When the sun rises I will get the sides to a satin finish and polish the chamfers on the edges to a mirror finish. I was very generously given some Ziricote recently, so that is what this plane is made of. The pictures of this plane are all in the image gallery now, I figured there have been enough handplane updates for now until I get the Krenov tutorial going.